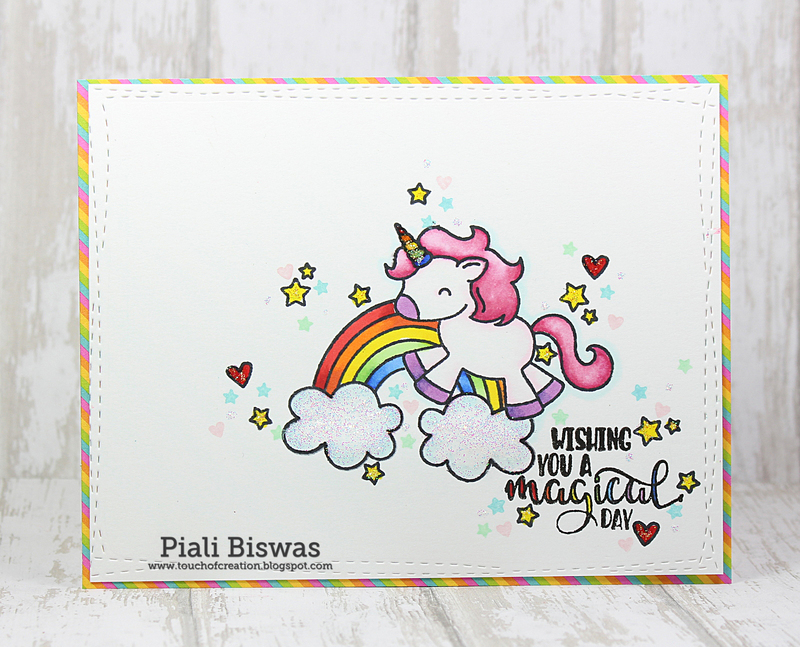 I'm back with the second post for the day..
Today I'm also on Butterfly Reflections Ink blog sharing few fun cards ! I got a new package from the BRI store recently , so I used few of the new crafty goodies for these cards. 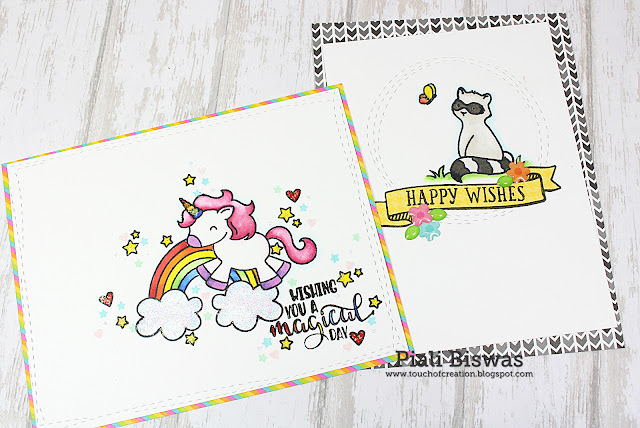 One of my favorite thing from the recent BRI happy mail is the Mini Misti tool....cutest thing ever super compact and fabulous for cardmaking!!! 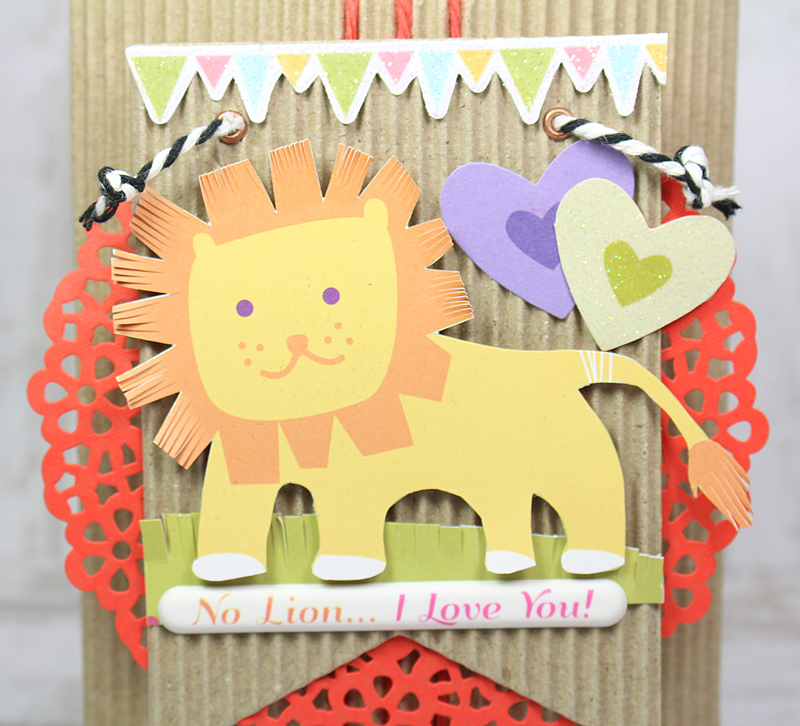 I have used new Avery Elle stamps for my cards .. 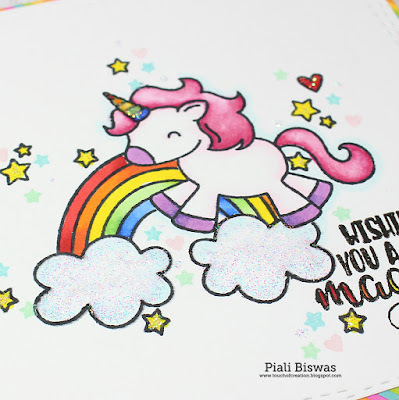 The cutest Unicorn stamp ever!!! The set is called Be A Unicorn. Unicorn Challenge - Clean and simple. Dream Valley Challenges - Girlie. I did a bit of masking for this images.. I colored the image with Copics and applied some Diamond Stickles . 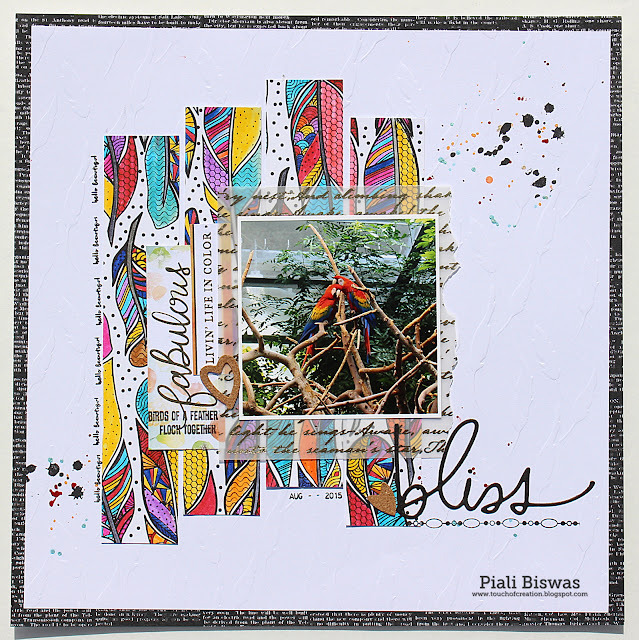 I used Doodlebug papers for layering. 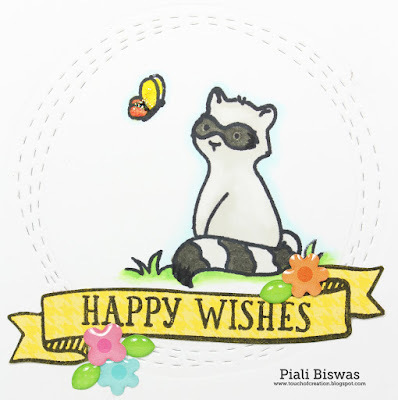 Next on is with a super cute Raccoon..
... from the Avery Elle Woodland Wonder stamp set. Simple Copic coloring for quick & easy cards. I added few Doodlebug Tiny Flower Sprinkles to the banner. 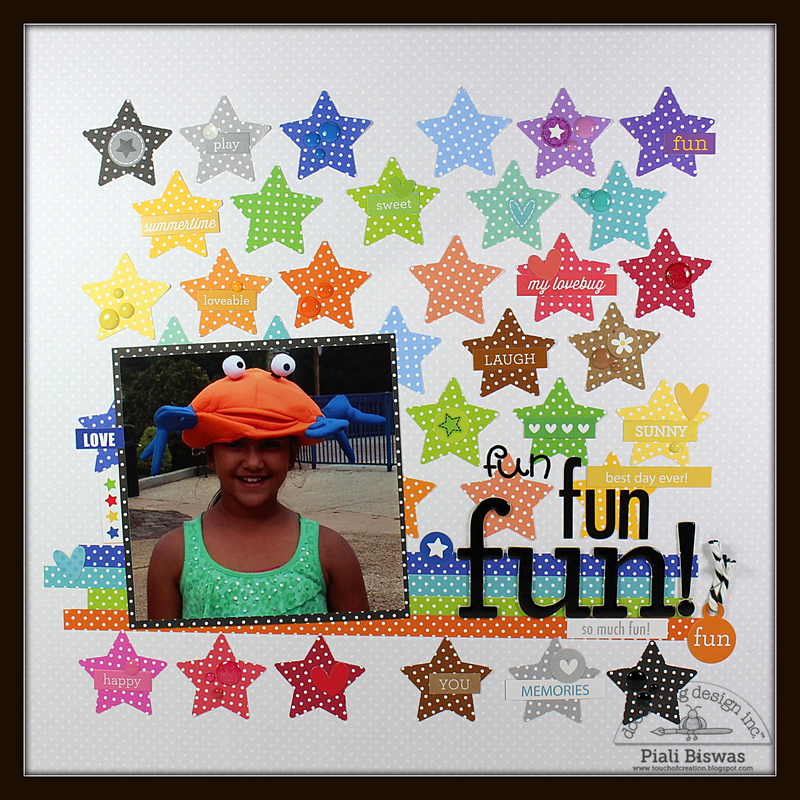 Sweet Stamps - Anything goes. Hope you all like these cards!! Make sure to check the BRI Store for all the latest & greatest products!!! 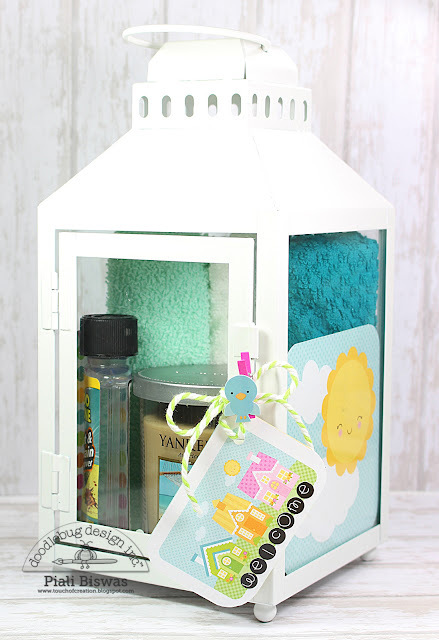 Today I'm on DCWV blog sharing a fun layout . I'm so loving all the new released DCWV stacks !! I used the Create & Color , Watercolor and Embossed White stacks. Color & create stacks are amazing, they are not just Adult coloring pages, these beautiful stacks can be used in scrapbooking, card making and much more. Simply started by coloring the feathers...its a pretty relaxing part of the project. Then I trimmed the colored page into four stripes ....for a fun colorful background. This Embossed stack is my favorite one as I don't have dies or embossing machine big enough to dry emboss 12"X 12" paper, so DCWV does that for me, its amazing! 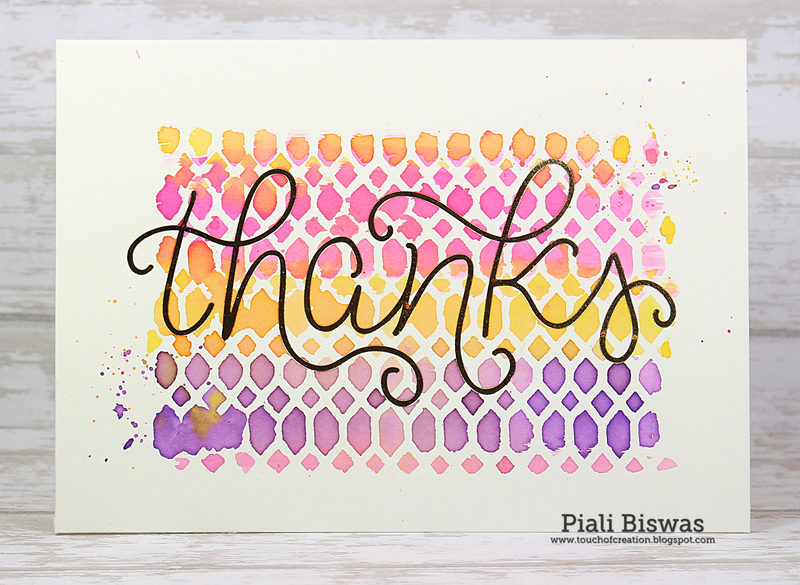 I also added few Gold prints for my subtitle from the Watercolor stack. Adhesive mat stack is perfect for die cutting delicate titles, it easy to attach to layout without any liquid glue mess. Colouring in Scrapland - Anything goes. 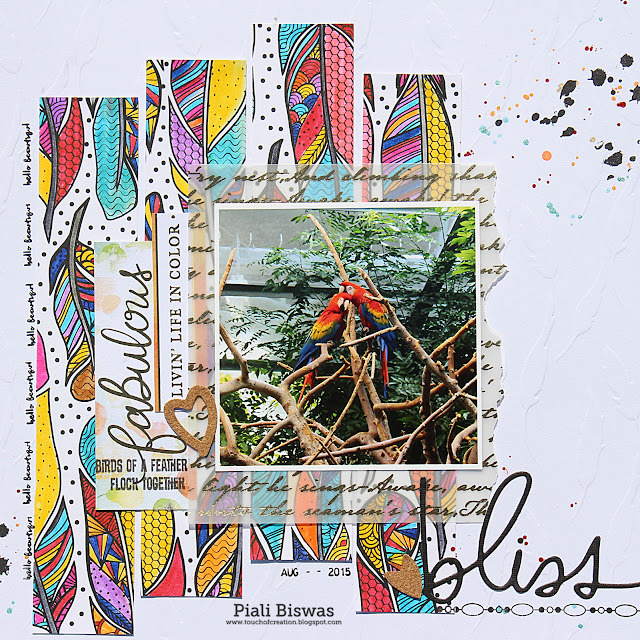 Ooh La La Creations - - Feathered Friends. Hope you like this simple & colorful layout! All the new stacks I used for this project are available at Joann Stores. Hello & Happy Monday Everyone!! Hope you all had a wonderful Easter weekend!! Today I have a layout to share with you all! 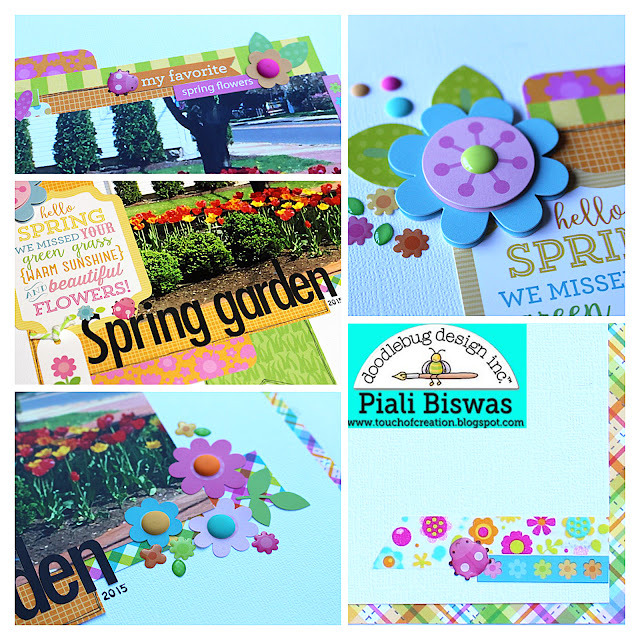 I used the beautiful Doodlebug Spring Garden collection! Perfect collection for a Spring garden layout!!! Loooooooooove the Matte Sprinkles, absolutely amazing thing ever!!! The ladybug sprinkles are the cutest! I used the Skinny Alpha stickers for my title. 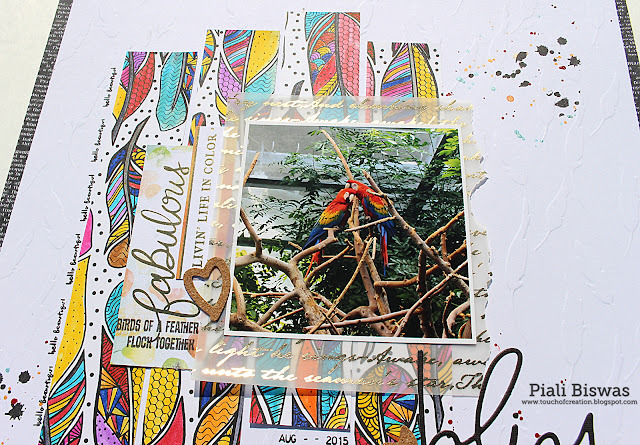 The beautiful hello spring sticker said all about my layout perfectly, I didn't need to add anymore journalling. 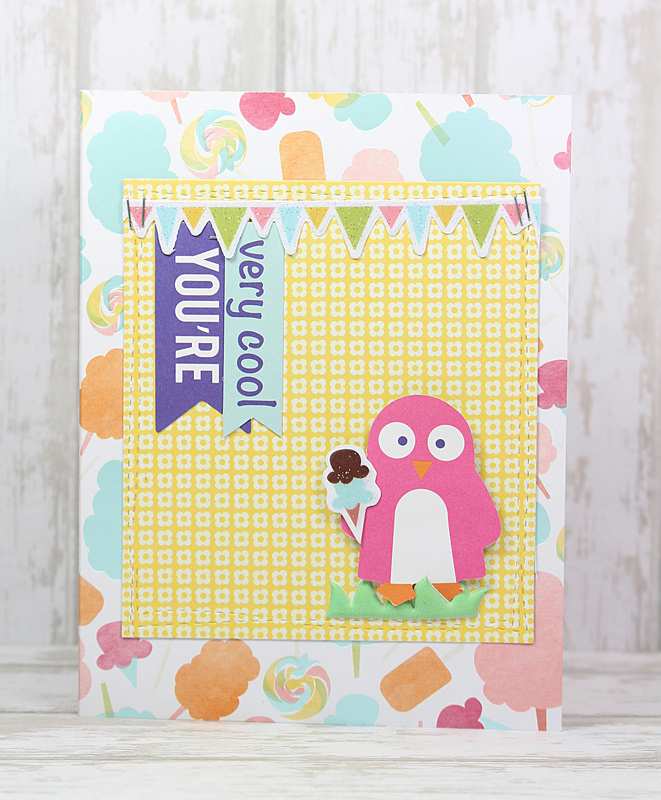 I also used Doodle Pop flower sticker, chunky twine and lots Sprinkles for this layout. Hope you liked this layout!! Bunnyville is super cute collection! I love using paper collection beyond its theme, so today I used Bunnyville for a non-easter project. The cute house icons in this collection are perfect for a new home projects. A card for the new homeowners. A gift ....just a candle few hand towels, stain removers and air freshener...few home essentials. The recipient can use the lantern as a candle holder. I also used mini clothes pin, chunky twine and alpha stickers for the tag. 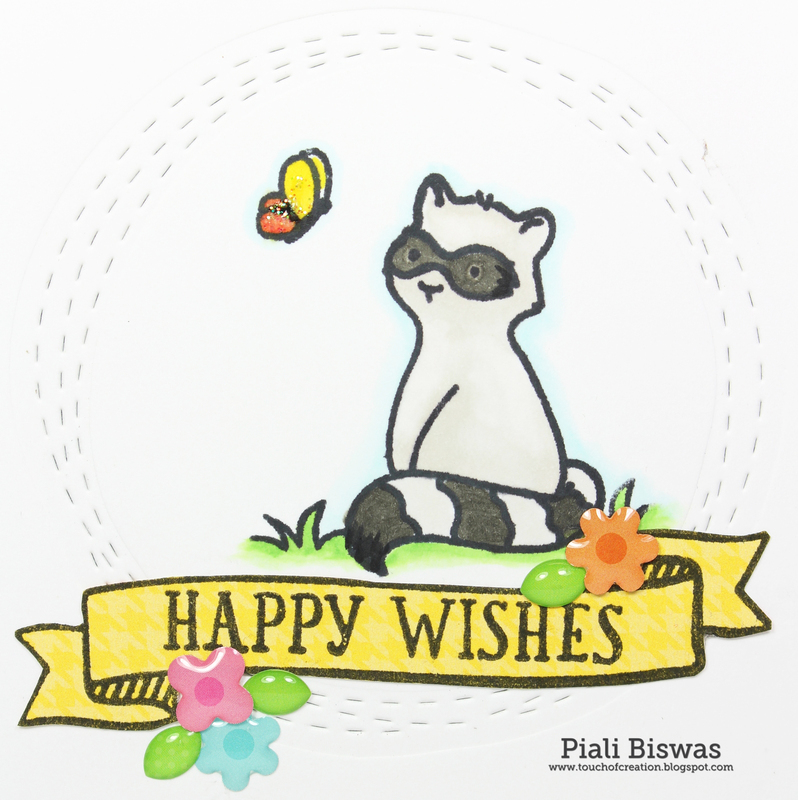 A small decor item using silhouette cut, Doodle Pop sticker. Loooooove the super cute sun printed paper!!! A plant makes a great house warming gift! 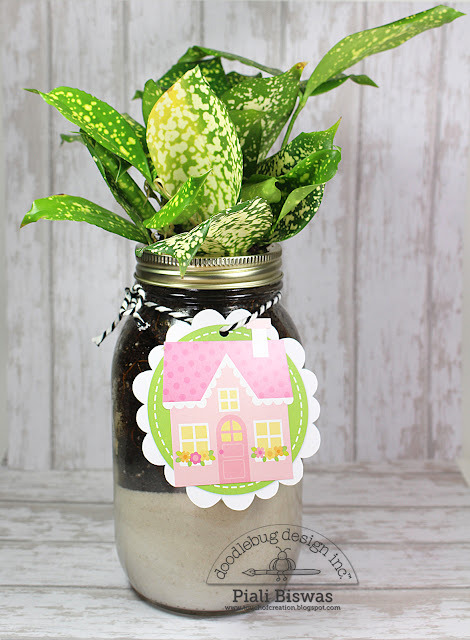 I planted a house plant in a Mason jar and attached a cute tag. Hope you all like this gift idea!! Today I'm on DCWV blog sharing few fun new projects ! 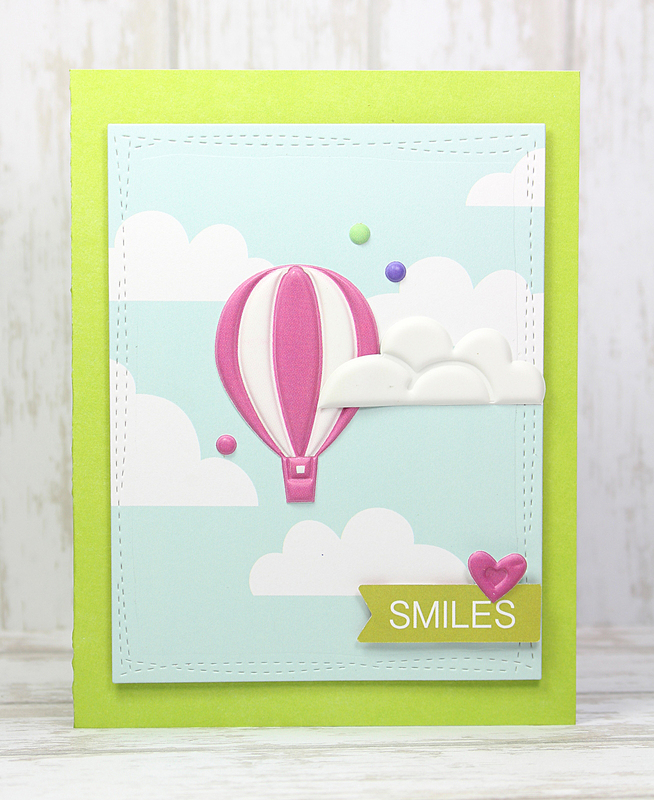 The new Paint & Create watercolor card packs by DCWV are simply amazing!!!! The card pack contains cards, envelopes and water color paints & a brush. 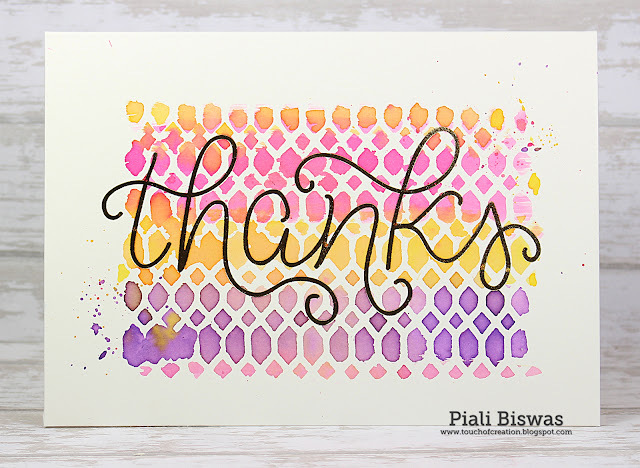 A total package ready for you to create super trendy card in few minutes..
A simple watercolored thanks card. I used DCWV stencil and simply watercolored over the stencil. This gives a cool patterned look to the background. 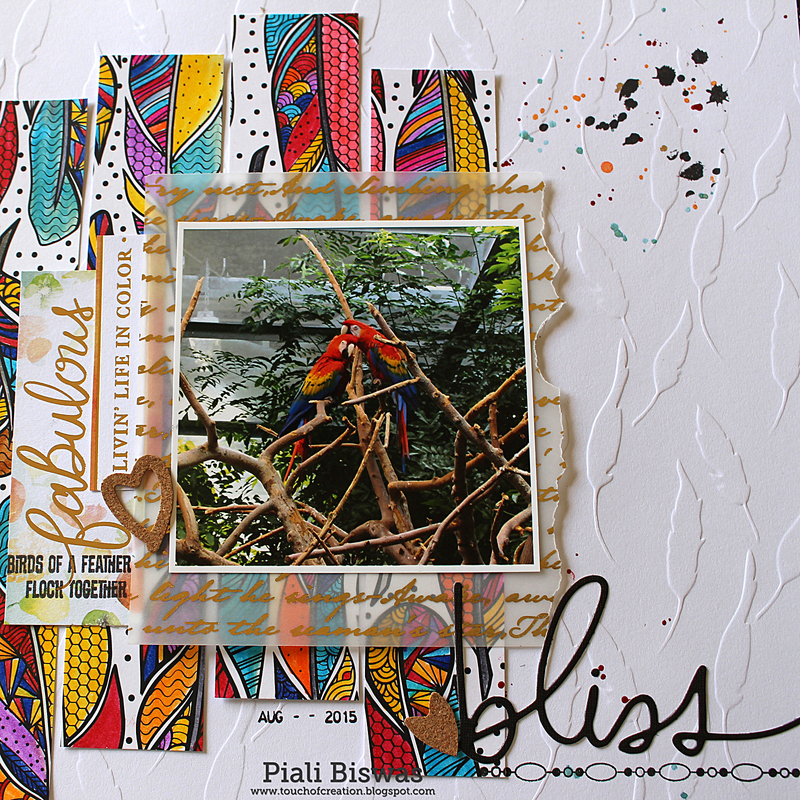 Less Is More- One layer card. I used one of very favorite new DCWV stack...Stitched. The really stitching is beautiful and adds so much texture to the project...fun part is its all done for me I didn't have to stitch it myself. I watercolored the card and added the stitched feather panel to it . 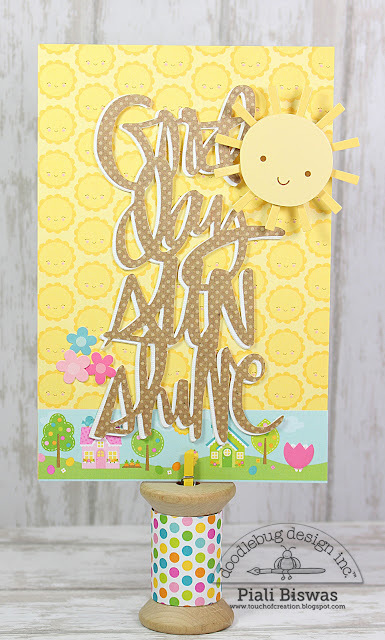 Crafty Sentiment Designs - Anything goes. Through The Craft Room Door -Anything goes. This is a mini layout. I'm trying to teach few 10 year old girls how to scrapbook...so I made it as simple as possible. I used the new DCWV lace paper stack and the Water colored paper stack for this easy layout. Not Just Cards - Anything goes. Scrappers Delights - Anything goes. All the new Paint & Create stacks are available in Joann stores near you or online at Joann.com. Hope you all like these projects!! Today I'm SEI blog sharing few projects using Bits of Joy paper collection . 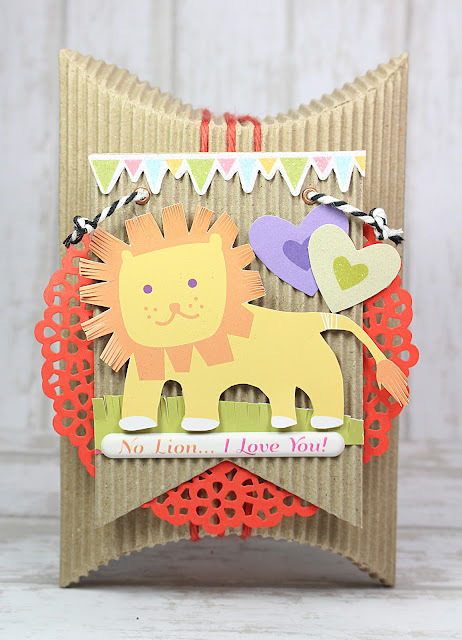 I used the January Card Kit for this project. The Bits of Joy the paper collection is super cute and happy, love the fun colors & prints! I used the cards from the kit. Love the hot air Balloons. The puff stickers are just amazing! These penguin is soooooooo cute! SEI corrugated pillow boxes are my favorite gift packaging, love the nice size, great for small gifts or giftcards or chocolates. I also used the corrugated banners & beautiful doilies. For a fun look, I snipped the lion's mane . Love this puff sticker sentiment! Hope you all like these fun projects!! Today I'm sharing a layout over at Doodlebug blog!! Did you all get a chance to see the new Doodlebug Swiss Dot Prints yet??? Absolutely fabulous prints in amazing yummy Doodlebug colors!!!! These Swiss Dot Prints are very crafter's staple! This one of my favorite photo of my youngest , she loves to wear and collect hats. I love these yummy colors and the teeny tiny polka dots!! 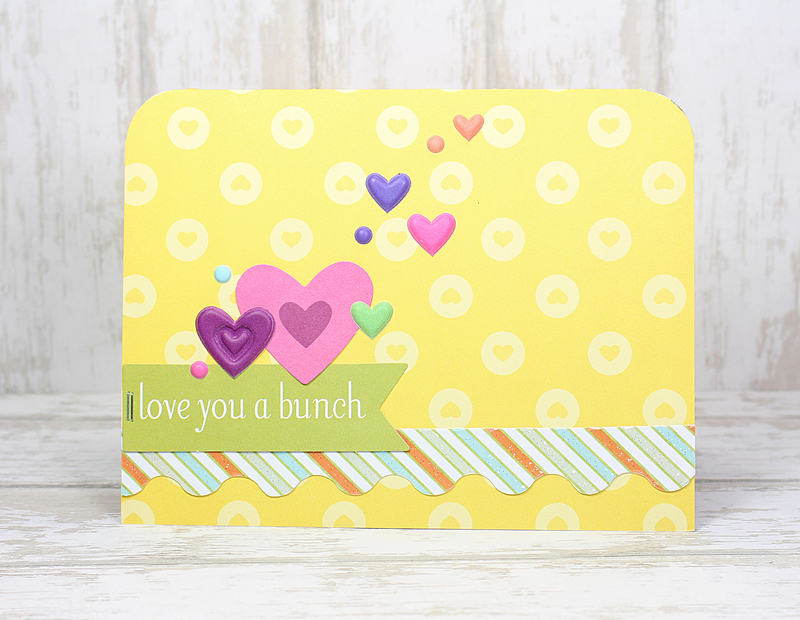 I used stickers from various Doodlebug collections...they match so perfectly with these colors! I also used Sprinkles and Alpha stickers. Hope you all like this layout!